Peer up into the night sky and marvel at the excitement of these fireworks. Fasten your seatbelt and climb aboard the rocket as you take a trip through 25 colourful paylines and 5 banging reels of casino slots. Gather more information about the game when you play online slots. Fireworks Frenzy is a super online slot games for those who like some pyrotechnics in their lives! Here in the United Kingdom we celebrate “Bonfire Night” or “Guy Fawkes” night on the 5th November and this usually involves letting off a whole bunch of fireworks, and the clever people at Eyecon have decided to base slots on this theme. So we’ve got a 5 reel slots game that tries to capture the essence of 5th November and Guy Fawkes plan to blow up the Houses of Parliament. We love the team at Eyecon as their games are always fun, full of detail, great content, and with great bonus features. This game is no exception and joins the ranks of sure fires successes that Eyecon is known for. This one is bound to go down with a bang! 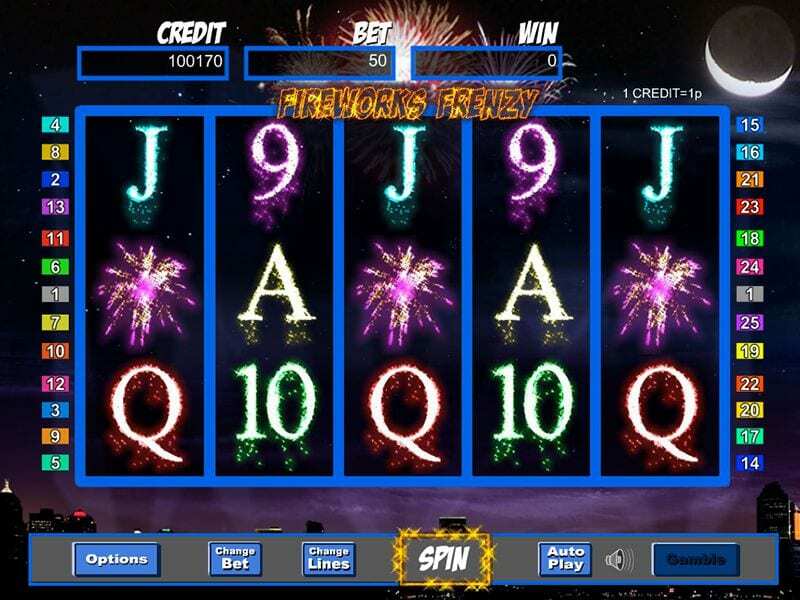 Fireworks Frenzy is a slot game that has a nice clear and simple interface with a black background and offers 5 reels and 25 paylines without too much other clutter or complication. The reel symbols are made up of the various types of fireworks and something that gives them a nice impact on the screen. We recommend you try the best slots available like this one. This slots game is perfect for new players, its simple to operate, and offers some good betting options with the lowest bet being 25p and the maximum still being within the budget of many at £2 per spin. However, as a consequence, it might not suit more experienced slots game players who are looking for larger wager options and bigger jackpots. The game has a nice bright feel helped by the contrast to the black backdrop, and the reels all have symbols which are represented by the various types of fireworks, as well as letters and numbers. The sound effects can sometimes get a little too much, so if that does bother you feel free to run the sound off or mute your speakers. A game needs more than just some fancy graphics and sound effects though, and so this game comes into its own with some nice gameplay and bonus features. 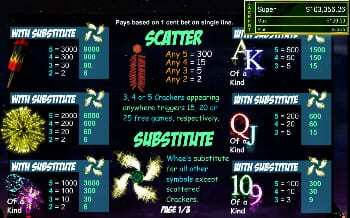 The first bonus is the Wild symbol, which in this game is the Catherine Wheel, and this can substitute for all the other symbols except for the Chinese Cracker, which also happens to represent the scatter. Your first bonus is the free spins opportunity, which is much loved by slots games players, and this is activated when a player lands 3 or more scatter symbols anywhere on the reels. If you land 3 scatters you will score 15 free spins, for 4 scatters 20 spins and hit the full 5 and you will receive 25 free spins. The second bonus feature is the “gamble” option which gives you the option of betting you win to double your winnings. It’s a fun, albeit, high-risk strategy but a way of nicely increasing your prize pot. Its all or nothing though! This is a decent effort from Eyecon and players will be attracted to the design primarily. 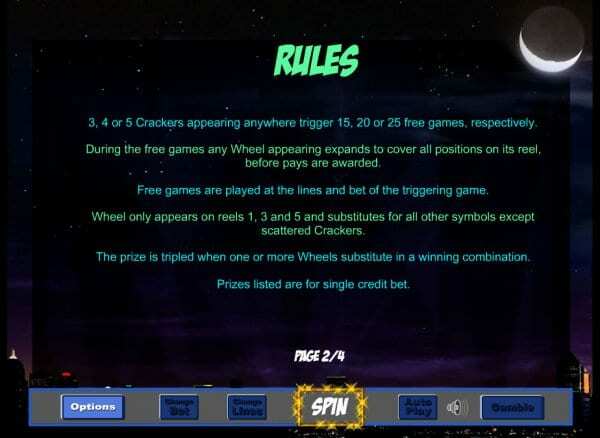 There are also some classic bonus features that enhance the gameplay and when you combine the graphics and gameplay, you have a pretty solid five reel slot. Players will probably be attracted by the clear design and ease of use. The bonus content is also clear to use and this combined with the betting flexibility means the game will appeal greatly to newer and less experienced players. There’s still a lot of fun to be had for old hands as well however so don’t be put off. This is a very solid offering and one which we enjoy greatly. Why not also have a play on our chilli gold slot?